In the 1990s, as the new digital media and networks were emerging, it became obvious that graphic design was the core discipline through which the components of the new media could be integrated, designed and presented. Graphic design is a twentieth-century discipline that drew upon the 500 year-old traditions of printing and publishing, the 19th century developments in advertising, poster design, and photography, and the early 20th century innovations of a swathe of influential designers. El Lissitzsky: Electro-Library! 1923 This fascinating poster, designed by El Lissitzky in 1923, is indicative of the revolution in print design in the 1920s. El Lissitzky is one of the great prototypical designers of the early 20th century. He epitomises the designer who is familiar with the latest reprographic technologies, and in his stage and exhibition-design he is already mapping the territory that will be fully explored in the latter half of the century, and in this, and his own philosophy of art/science/technology, firmly based on mathematics, he has become an exemplar for current multimedia designers. El Lissitzky sits alongside the greatest designers of the 20th century. 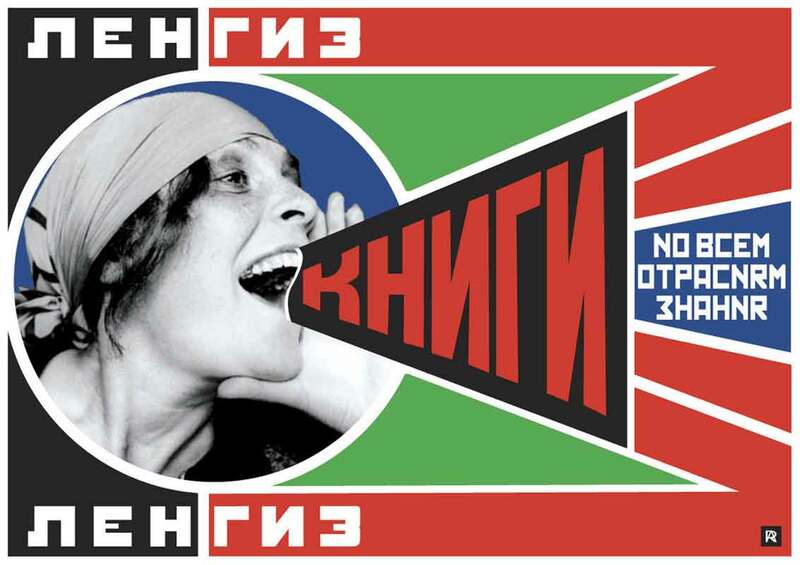 Along with Rodchenko, Moholy Nagy, Tschichold, Rand, and half a dozen others, these designers set the agenda for the blend of information-design, graphics, photo-collage and combinations of typography and photography that now dominates both design education and current practice in the digital arts. His astonishing, and as Hans Magnus Enzenberger points out (in Towards a Theory of New Media 1970), at the time virtually incomprehensible suggestion of: “The future of book design resulting as an Electro-Library (what is that?). from the poster: “the design of the bookspace through the material of the process block, which creates the new optics. the supernaturalistic reality of the perfected eye. the continuous page-sequence – the bioscopic book. the new book demands new writers. Inkwells & goose-quills are dead. the printed page transcends time and space, the printed page, the infinity of the book, must be transcended. THE ELECTRO-LIBRARY! 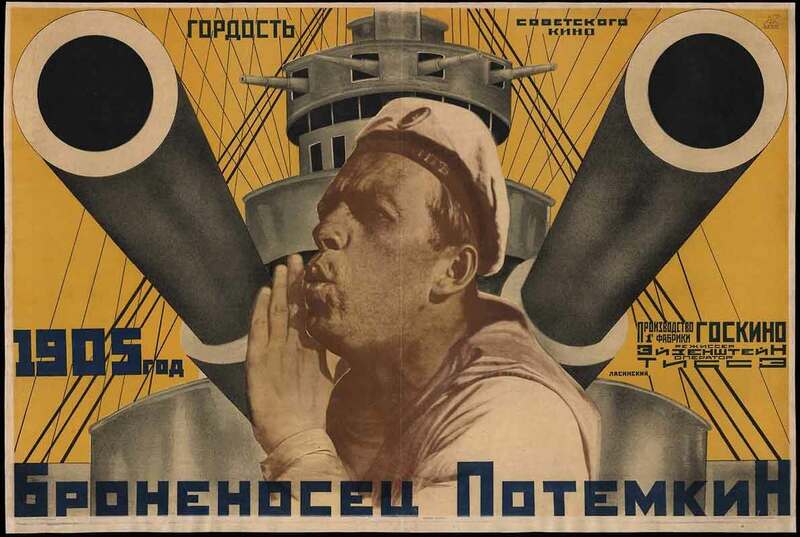 Alexander Rodchenko: poster for Battleship Potemkin 1924 Rodchenko became an early master of the integration of typography and photography. It’s hard for a young 21st century designer, used to working entirely in the digital domain, to understand the technical difficulties of producing this kind of work in the 1920s. There were two main ways of making these graphic works: Making a photomontage with printed type and with photographs, then having a half-tone plate made of the entire graphic, and overprinting with extra colours and with a separate overprinting with letterpress display fonts. Or secondly, it would be pheasible to have halftone plates made for the contone (photographic, continuous-tone) components, and physically cut the zinc plates, before mounting them on type-high pywood for printing. To retain the sharp letterforms, an overprinting of the type would be the final printing. 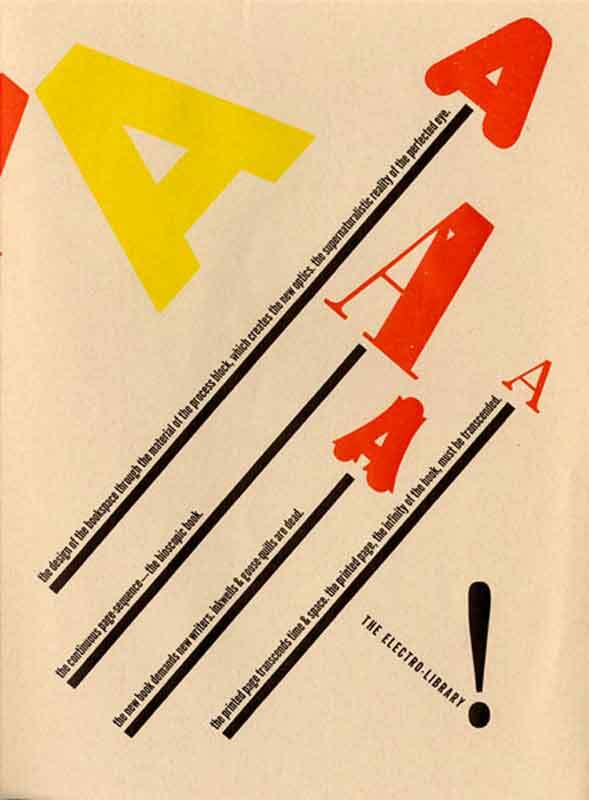 These designers, from Peter Behrens and his ground-breaking identity for AEG (1906-1914), to the DADA artist-typographer Raoul Hausmann, and the De Stijl artists (1917-1920), to Lazlo Moholy Nagy at the Bauhaus, Alexander Rodchenko in civil-war Russia, Fortunada Despero in Italy, Karel Tiege, Piet Zwart, Jan Tschichold in other parts of Europe, plus the influence of DADA, De Stijl, Surrealism, Russian Agitprop, (etc) all contributed to the emergence of the new profession. 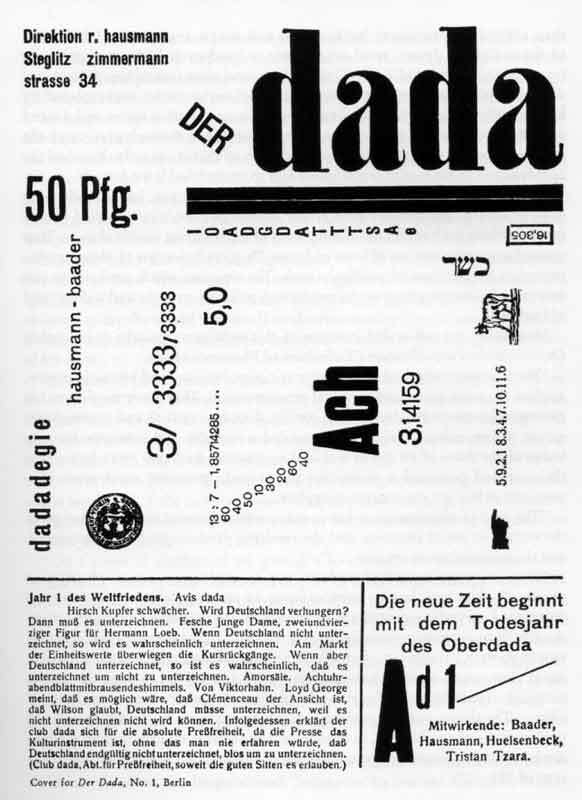 Raoul Hausmann: DADA issue 1 1918 the DADAists were the first to really break with 19th century conventions of type-design and typography. Here Hausmann uses display fonts, body-copy fonts and printer’s furniture (the rules, blocks, logos and symbols) to make an assymetric design, that was a radical redefinition of page-design. Other important ingredients in this emerging discipline (not really to be called ‘graphic design’ until the 1950s) included late 19th century designers like William Morris, Frank Lloyd Wright, Charles Rennie Mackintosh, Aubrey Beardsley, the Beggarstaffs, Alphonse Mucha, Henri Toulouse Lautrec, Arthur Macmurdo, (etc). And of course, the emerging information sciences of the 1920s and 1930s played a core role in informing the graphic design of statistical information (Otto and Marie Neurath: Isotypes (1930s); and geographic information (Harry Beck: London Underground Map 1933, Phylis Pearsall: London A-Z, 1936), and information taxonomies (the work of Paul Otlet in the 1930s). All these various ingredients, together with innovations in letterpress, hot-metal, photo-gravure, halftone, trichromatic colour printing, (etc) informed the new industrial-design of graphic artefacts. Recently, in its digital iteration, graphic design has embraced the moving image, animated typography, even the use of sound and music. It has become the design discipline that above all others, integrates all these multimedia components, and information-design, as well as becoming the art underpinning the graphical user-interface and screen-based content design generally. I’m planning more detailed posts on individual designers, as well as on the development of all the component media of the 21st century media-ecology.